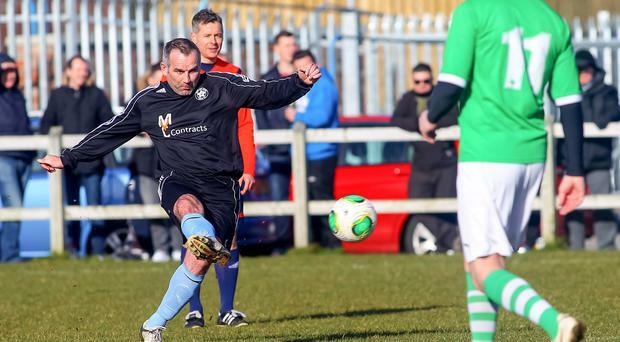 Glen Ferguson scoring a free kick in action during the charity match for Sport and Leisure Swifts back in 2015. The club are hoping a change of name might mean a brighter future with more top level players pulling on their shirt. The club, who play in Northern Ireland's third tier, the NIFL Premier Intermediate League will take on their new mantle from next season. The decision to change the club's name was taken at their AGM earlier this month. Club Press Officer Gerry Kelly explained the reasons behind the change. "The desire to improve the club, to improve the footballing prospects for young people in west Belfast and to promote a high level of sporting in the city," he said. "Other parts of Belfast are represented by well-established clubs with household names, such as Linfield, Glentoran, Crusaders and Cliftonville. Since the departure of Donegal Celtic last season and Belfast Celtic from the league 70 years ago, west Belfast has remained without true representation at this level. "We will develop the club to maintain high standards, strive to reach the top tier and create a strong fan base in Belfast to meet the demands of the community for a team that encompasses the spirit of Belfast Celtic." The club are hoping to follow in the footsteps of the old Belfast Celtic and aim to form links with the Belfast Celtic Historical Society. They have also invested in an U13 team and an U19 development team. The Glen Road Heights Men are hoping for buy-in from the local community to ensure the change is a success. "We look forward to this challenge, to the potential footballing fixtures, the expected success and the ability to provide high quality, exciting and historic football," Mr Kelly said. By Alex Mills Defender John Boyle admits that the odds are stacked against Newry City as they aim to avoid the relegation trap door tomorrow - but they will give it their all in tomorrow's final match. By Steven Beacom Warrenpoint Town boss Stephen McDonnell will only be thinking about his own team's display and not the part they could play in the relegation battle tomorrow.